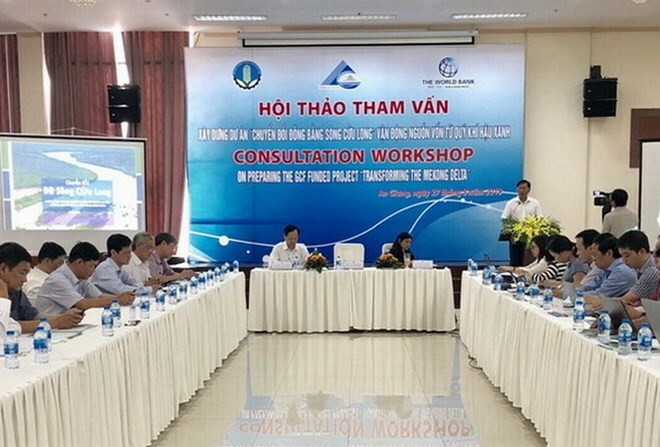 An Giang (VNA) – The amount of alluvium in the Mekong Delta has dropped about 65-75 percent and is forecast to decrease over 90 percent in the future, heard a workshop in An Giang province on March 27. Dr. Le Minh Nhat from the Vietnam Disaster Management Authority under the Ministry of Agriculture and Rural Development gave the warning at the consultation workshop on preparing the “Transforming the Mekong Delta” project funded by the Green Climate Fund (GCF). The Mekong Delta and Long Xuyen quadrilateral, encompassing Kien Giang, An Giang, Hau Giang and Can Tho, in particular are facing serious river bank erosion with total length of 520km due to construction activities, he said. Apart from erosion, the region has grappled with drought and unusual high floods as a result of climate change impacts, given its great contribution to national economic development. Among eight agricultural products with export value exceeding 1 billion USD in the country, the Mekong Delta is home to five namely shrimp, tra fish, fruit, rice and vegetables. Climate change has also caused challenges to agricultural production and affected livelihoods of residents in the Long Xuyen quadrilateral which covers 500,000 hectares or 20 percent of the region’s total area, with strength in rice production, aquatic products and fruits. Nguyen Si Lam, Director of An Giang province’s Department of Agriculture and Rural Development, said in 2016 the sub-region suffered from drought, saltwater intrusion and unseasonal rains. Last year, flooding has changed the crop schedule and affected livelihoods as well as daily life of local residents, he said, adding that the decreased alluvium has resulted in higher cultivation costs and reduced profits in rice production. Another problem facing the sub-region is depression which has led to declined natural aquatic resources and imbalanced biodiversity, according to the official. Experts suggested the provinces roll out plans to manage river banks comprehensively and plans for the use of land along river bank corridors. Tran Anh Thu, Vice Chairman of the People’s Committee of An Giang province, said the Long Xuyen quadrilateral should develop in harmony with the nature, and livelihoods for local residents and infrastructure in transport and irrigation should match its ecological conditions. Anjali Acharya, a senior environmental expert of the WB, said the CGF aims to provide about 40 million USD in non-refundable aid for Vietnam to carry out the “Transforming the Mekong Delta” project, focusing on Dong Thap Muoi and the Long Xuyen quadrilateral.